It's the second time I've posted with this provocative title. The first time, I was just reposting the title of a talk given by Jeff Moore at the 2008 meeting of the American Geophysical Union. This time, it's in response to a new paper published last week in Science by Luciano Iess and his coauthors. How does this probe Titan's gravity? Cassini's acceleration as it flies past Titan is sensitive to how mass is distributed within Titan. Titan's a solid object, so how can mass be distributed unevenly within it? Consider Earth, which has a highly anisotropic mass distribution. Earth has a metal core with a density of upwards of 20 grams per cubic centimeter; all the way up where we stand on the crust, its density is barely more than 2.5 grams per cubic centimeter. Titan is made of the same stuff Earth is, though in different proportions: it started out its existence with more water ice and less metal than Earth, so overall it has a lower density than our planet does. But knowing its overall density doesn't tell us whether it's internally stratified, like Earth is, or mostly not, like Callisto. 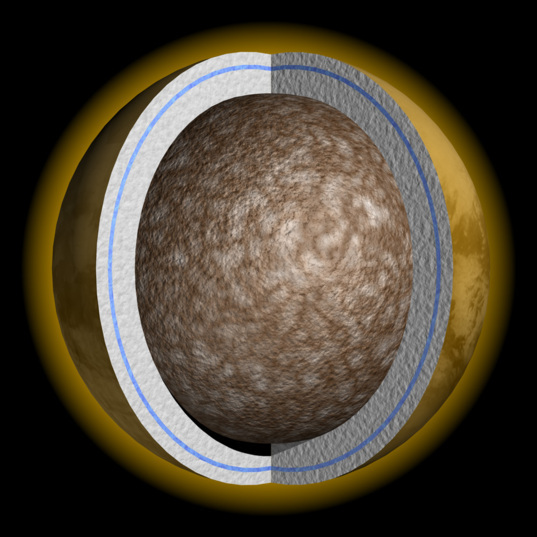 Until recently, it's been assumed that great big Titan is internally stratified into a core of metal, then a layer of rock, then ice, then very likely a bit of ocean, followed by its ice shell and its atmosphere. Why do we care if Titan is internally stratified? Because internal stratification goes hand-in-hand with internal geologic activity. If Titan is an active world -- as would seem to be the case, given its youthful-looking surface lacking many craters -- then it's natural to assume it's internally stratified. And numerous peer-reviewed papers have been published on volcanic edifices on Titan -- even on active volcanism on Titan. Not so fast, Jeff argued. Here's a bit from that 2008 post on his talk: "The only unambiguously identified features on Titan are exogenic -- fluvial, aeolian, and impact. There are no unambiguously identified features that are endogenic -- tectonic or volcanic." That is, we have very strong evidence that the surface is shaped by processes that result from the atmosphere, things like rain and wind. But so far the jury's out on whether there are internal processes going on. To be fair, Jeff pointed out, it may just be that the data isn't good enough yet. He asserted that despite the accomplishments of Cassini's four years at Saturn, "the state of imaging on Titan is similar to state of understanding of Mars after Mariner 6 and 7." Imaging is similar in extent and resolution; after Mariner 6 and 7, the jury was out on whether anything besides cratering had shaped Mars' surface. So what the gravity data says about Titan's internal structure is really important. And what does it say? The Iess et al. paper states that Titan's shape is the one that you would expect from an icy body responding passively to the forces of Saturnian tides and its own rotation, and that its mass is not concentrated in the center as it is for Earth or even Ganymede. Titan's mass is more concentrated toward its center than it is for Callisto, but still it appears that if there has been any separation of Titan's icy component from its rocky component, such separation (known as "differentiation" among geophysicists) is incomplete, and that there is either "imperfect separation of rock from ice or a core in which a large amount of water remains chemically bound in silicates." 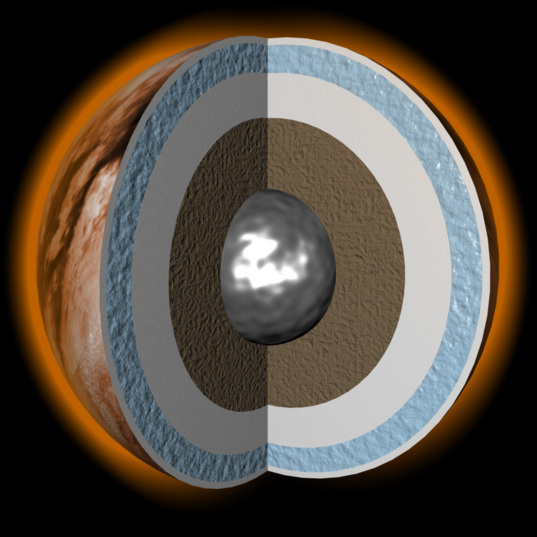 A computer-generated view exposes Titan's internal structure: layers of ice (containing an internal ocean), rock, and a metal core. Studies of Titan's gravity have shown that Titan is very likely only incompletely differentiated, meaning that its component materials (ice, rock, metal) are not separated into layers according to their density. The distribution of its internal mass is intermediate between Callisto's (which is not differentiated) and Ganymede's (which is). As I was composing this entry, I got another email from Bob Pappalardo pointing me to a new paper in press that's relevant to this subject, by Francis Nimmo and Bruce Bills. They look at Titan's topography and find it to be a bit higher than they'd expect for an icy world (as Jeff More also pointed out), suggesting it has a thick, rigid outer ice shell that is not presently convecting. Convection -- in which warm material from depth rises, flowing in the solid state, while cool material from the surface sinks -- is the engine that drives geologic activity on Earth and presumably other worlds as well. So, "not convecting" implies "not geologically active." These will be fighting words to some researchers, of course. It's a good thing Cassini will be at Saturn for more than seven more years! There's a lot yet to be learned. I want to take this moment to issue some congratulations. Bob Pappalardo has been leading the Cassini mission as its Project Scientist for a short time, only 20 months. As of today, he is leaving Cassini, moving on to a full time position as the project scientist for the Europa Jupiter System Mission currently under development at the Jet Propulsion Laboratory. Bob will be replaced on Cassini by Linda Spilker, who has been Deputy Project Scientist, who's steered Cassini's science from its beginning. So, congratulations to Bob and best wishes that he'll see the Europa mission through development, launch, arrival, and science mission at Jupiter; and congratulations, too, to Linda, for rising to the scientific helm of NASA's outer planet flagship. 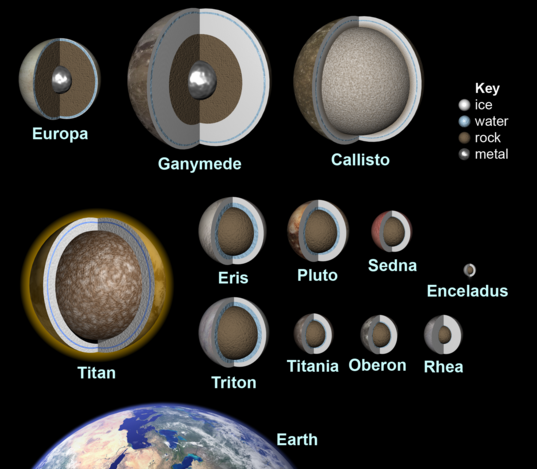 The diagram wrongly suggests Eris is larger than Pluto. Bruno Sicardy's data clearly shows that the state-of-the-art data is that Pluto is more than 7 miles wider in diameter than Eris. Please correct this gaping error. Thanks. Data from Eris's November 2010 occultation of a star definitively show that initial estimates of Eris's size were incorrect and that Eris is actually marginally smaller than Pluto. Therefore, this depiction above, in which Eris is larger, is based on outdated information. Also, it is hardly accurate to describe these worlds as icy when they are largely composed of rock. We need a better descriptor that makes it clear these are worlds of mostly rock with an outer layer of ice; otherwise, the public erroneously perceives them as comets, in other worlds, "dirty snowballs" composed almost entirely of ice. The term for Pluto, Eris, and Sedna should be Kuiper Belt planets rather than Kuiper Belt Objects, as these larger bodies are very distinct from the majority of tiny KBOs in that they are much more complex and likely geologically active as well. Significantly, many of these worlds are places where microbial life could exist undernearth a subsurface ocean. All should be further studied.